This is the second part of a two-part post on engaging and strengthening your hips to improve your running and to reduce your injury risk. Here is a link to the first part. When we analyze our injuries, as we recover from them, we look for ways to prevent the same injury and reduce the risk of other injuries we fear will follow. At times we forget to look upstream and downstream in the kinetic chain. Lower body injuries often times begin in the hips and thus, hip strength and engagement should become an essential part of our training. This one is going to feel awkward, but it helps with knee alignment and getting the max benefit from engaging your glutes. This is a drill not the way that you will run. Part of what the glute does is rotate your hip outward. This outward turn allows you to get maximal hip extension. It’s easiest to practice this on a line such as on a track or the white line at the edge of the road. Try to keep your knee turned out a bit while your feet remain directly beneath you. Start with short distances or 30 seconds a few times during a run and work up to longer durations of 60-90 seconds. High knee drills are the staple of many track teams and there is a reason for it. It works the hip muscles for both legs. You use your abdominals to lift one leg while you get a lengthening in the other hip. While you’re running be aware of your knee height because this extra length in your hip flexor is going to give you more power. You don’t want to exaggerate the movement like you do in drills, but just checking in with your lift during your run will bring your attention to it enough to make sure your engaging those muscles. This one goes back to those tendons that connect your shoulder blades to the opposite hip. Maintaining a good arm swing where your wrist/hand comes to your hip on the back swing and your elbow comes in front of your hip on the forward swing, will help maintain a good strong rotation in your legs. Especially, in the later miles of an ultra. When your legs are thrashed from all the climbs and descents, have your crew remind you to run with your arms. You can also put a note in your drop bags. Having a strong foot is important for efficient powerful running. Feet, although necessary to running, are remarkably the lower body muscle group most neglected by runners. Your feet are what pushes you off the ground. Poor push off can misalign your leg as it comes forward. You also loose power if you don’t roll forward onto your toes. You can improve feet strength through single leg calf raises where you lower your heel below your toes on a step. You can also strengthen your feet using an exercise band by wrapping the band around your forefoot and holding it back with your hand to get the right amount of tension. Extend your toes out (tension pulling your forefoot to your chest), turn your foot in (tension should be pulling your forefoot to the outside0, and turn it out(tension should be pulling your forefoot to the inside). No one wants to be injured. 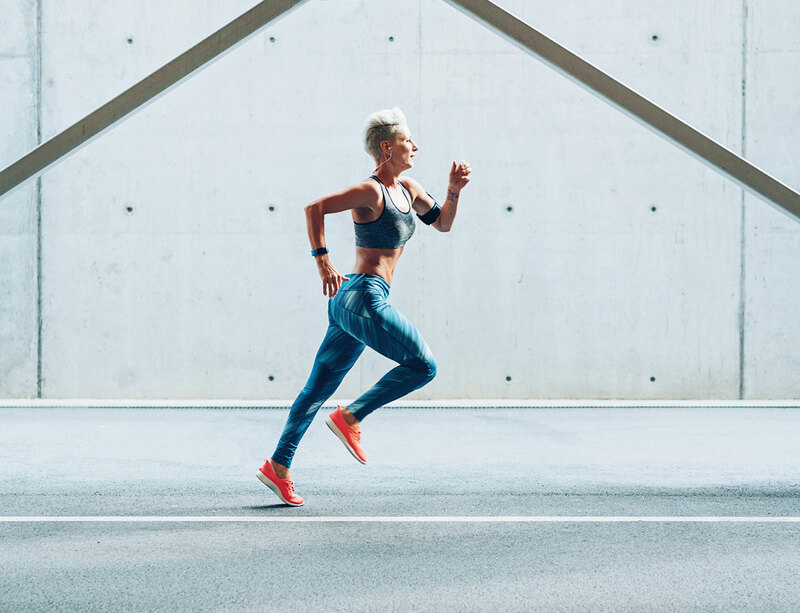 Research has shown over and over again many running injuries originate in the hips and spending some time each week focused on strengthening hips is well worth the time even if it cuts into running time. Running is a whole body exercise and because of this, you need to strengthen your entire body. If you don’t do any other strength training, do hip strengthening. Your hips drive you forward. There is a bunch of research out there that supports the importance of hip strength in preventing injuries in runners. Additionally, the fastest and surest way to improve your efficiency and speed is by doing hip strengthening. Why is hip strength so important? Your hips are a part of your core muscle group which is where all of your movements, upstream and downstream, originate from. Weak hips are actually fairly common among runners of all distances. And of course the farther you run the more likely you are to end up with an injury related to your weak hips. Your hips help stabilize your pelvis as you run. When I say hips, the muscles I’m including are: hip flexors, the outside and inside of your upper leg, your glutes, and your hamstrings. Hip flexors and hamstrings work together to move your leg back and forth. The inner and outer upper leg muscles make sure those leg swings are aligned properly with the rest of your body. Runners hip flexors and hamstrings tend to be tight exacerbating the problem of the weak hips. So what does weak hips cause? ITBand syndrome, runners knee, shin splints, bursitis, plantar fasciitis, and low back pain. As it turns out, hip strength alone is only one part of this equation. Don’t throw up your hands thinking, “this is too much!” just yet because this part is easy and doesn’t require work outside of your running. It’s a matter of being aware, aka proprioception; it’s knowing where your body is in space in relation to the other parts of your body. Sounds complicated. It’s not. It’s a matter of knowing what it feels like for your hips to be in the right position and then making sure they are while you are running. 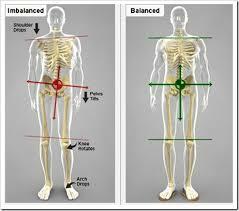 Your spine and hips should be in a neutral balanced position. To keep your hips in a neutral balanced position, think of your pelvis as a bowl. As you run, don’t let your bowl spill out the front, tipping too far forward, or the back, tipping too far back. During your training runs check in with your hips and spine asking yourself, are they were they are supposed to be. You can even do this throughout the day as you move around. Obviously, if they are not, correct them. Pretty soon this will become your form and you won’t have to think about it. Alright so back to strengthening those hips. Whenever you are doing strength exercises you should focus on the body part you are using and use slow controlled movements. Using proper form during the exercise is more important than pushing your body to exhaustion. Perform these exercises three to four times a week. You want to do three sets of 10-20 repetitions. Bridges: lay on your back with your arms down at your sides. Raise your hips as high as you can and hold for 2-3 seconds. You can progress to doing them with one leg, then two legs on a swiss ball, then single leg on the swiss ball. Jane Fonda’s: Lay on your side and lift the leg on top as high as you can. Hold your leg at the top for 2-3 seconds. Remember this should be a slow controlled movement. Don’t throw your leg up there because you could pull a groin. Inner thigh lift: stay on your side. Bend your upper leg and place your foot on the floor at your hips or knee. Lift your lower leg. Hold at the top for 2-3 second. Lunges: From a standing position, step forward and lower down until your front knee is bent at a 90 degree angle. Your knee should not be in front of your toes. Hold for 2-3 seconds and then do the other leg. You should be moving forward. Piston Squats. From a standing position, hold your arms out in front of you 90 degrees with your torso. Hold one leg up keeping it straight. Your foot should be 6-8 inches off the floor to start with. Bend your other leg, keeping your knee behind your toes. This one is difficult, so don’t be surprised if you can’t lower your self very far. Keep working at it. Your hips are the key to injury prevention and improving your running in both speed and efficiency and what runner doesn’t want those three things?